The very best of East Asia, all in a single trip? They said it couldn’t be done. This incredible adventure proves that with enough time and ambition, anything is possible. Join us and experience the must-sees and -dos of Taiwan, China, South Korea, and Japan with all sorts of luxurious twists along the way. For an adventure of this scope, there’s just no better jumping-off point than Taipei. An engrossing blend of Chinese, Japanese, and Southeast Asian influence, the Taiwanese capital is a delight to explore. With private guides, you’ll see the stunning Chiang Kai-shek Memorial, the Martyrs Shrine, and the National Palace Museum, home to the world’s most extensive collection of Chinese art – more than 620,000 pieces. Taipei is an entirely different city at night, as you’ll discover on a twilight tour of the famous Longshan Temple and the lively Huaxi night market before ascending to the top of Taipei 101, one of the world’s tallest buildings. Later, escape the bustle of the big city for a private exploration of Taiwan’s northern coast and Yehliu Park, famed for its incredible rock formations. Next stop: Shanghai, China’s gleaming city of the future. After settling in for a delicious welcome dinner and a spectacular performance of traditional Chinese acrobatics, explore the fascinating metropolis on the edge of tomorrow on a private cruise along the Bund, Shanghai’s famous skyscrapered waterfront on the Huangpu River. Later, see the city’s more serene side on a visit to the Jade Buddha Temple and Yu Garden, a vast Ming Dynasty garden that’s the perfect antidote to the frenetic city that surrounds it. Onward to Beijing, China’s political and cultural capital. After a dinner of Peking duck and a night out at the Liyuan Theater Peking Opera, you’ll visit the stunning 18th-century Summer Palace (a UNESCO World Heritage site) and come face-to-face with one of the world’s most ambitious architectural achievements on a private tour of the Great Wall at the scenic Mutianyu section. The full force of China’s history comes to life later on a private tour of three powerful symbols of China’s political and imperial might: sprawling Tiananmen Square, the majestic Forbidden City, and the Temple of Heaven, an oasis of calm amid the bustling capital. Tokyo, a dazzling mix of neon-drenched modernity and time-honored custom, is next. First, head into the backstreets of the eye-popping Harajuku district for an evening out that includes artisanal beer, grilled okonomiyaki, contemporary architecture, and a visit to the trendy food stalls of Aoyama. Then, explore the city’s must-see sights – the Meiji Shrine, traditional Asakusa, and the Sensoji Temple, among others – on a full-day private tour before heading out to Hakone for a full day spent exploring in the shadow of Mount Fuji at Fuji-Hakone-Izu National Park. The tour concludes in Kyoto, the spiritual heart of Japan. You’ll meet two of the city’s 17 UNESCO World Heritage sites on a private tour of Kinkakuji (the fabled Temple of the Golden Pavilion) and beautiful Nijo Castle, famed for its delicate craftsmanship and intricate design. Finally, say goodbye to Japan and Asia in perfect style on a full-day journey to Nara, the one-time imperial capital. 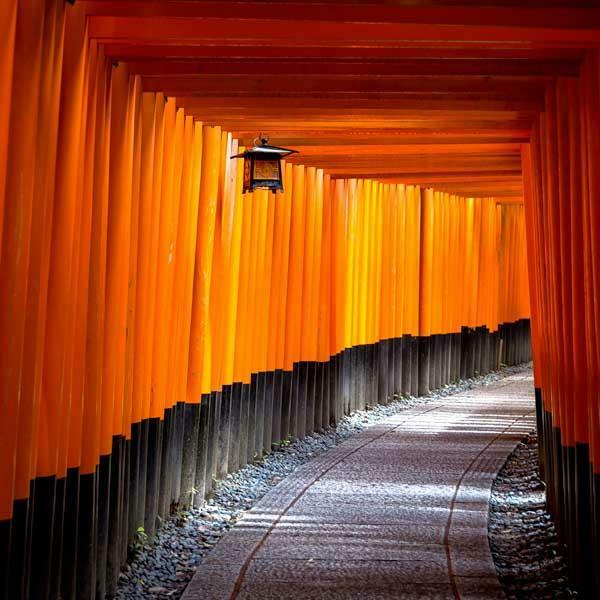 Here, you’ll explore Todaiji Temple (home to Japan’s largest Buddha), visit Kasuga Taisha Shrine, and spend time with the free-roaming deer of Nara Park before walking through the 10,000 torii to Fushimi-Inari Shrine, one of Japan’s signature experiences. Where were you half a million years ago? thousands of years, this has been the heart of commerce and political power in China. So when the folks here talk about having a sense of history, you can be sure they know that of which they speak. You will be able to taste just a bit of that history-but oh, how rich the sample will be. There is Tiananmen Square, the Imperial Palace, the Great Hall of the People, and Mao Zedong Memorial Hall, just to mention a few. An excellent way to see the city is to do as the locals do get on a bicycle and wend your way through the Beijing most tourists miss. It’ll be an unforgettable experience. Shanghai is China’s most cosmopolitan city (this due to the influence of the port, which brings a steady stream of international visitors). Many of the buildings are European in design, as is the layout of the wide boulevard known as the Bund. In the mornings, you will see the locals performing their tai-chi movements here. Be sure also to visit the Number One Department Store, your best bet for bargains in this region. Behind the Bund you will find another Shanghai, this one filled with low houses, winding alleys and mysterious looking courtyards. It’s worth exploring if you have the time.